Residents learn from highly dedicated faculty the skills needed to provide excellent perioperative analgesia, as well as to provide relief for patients in chronic pain. Residents in our program benefit from a range of rotations and care for all types of patients. Due to the number and variety of cases, most of our residents complete their ACGME-required cases by the end of the CA-2 year. 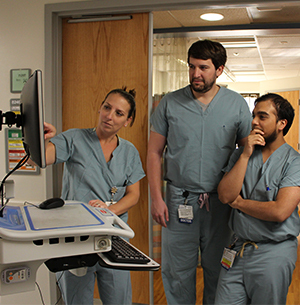 Throughout the CA-1 to CA-3 year, residents rotate through subspecialty OR clinical rotations taught by faculty specializing in pediatric, obstetric, neurosurgical, cardiac, regional and outpatient anesthesia. We are also developing new, innovative rotations to give CA-3 residents leadership experience in OR management and other critical skills that they will need as practicing anesthesiologists. Additionally, our residents have participated in the ABA Anesthesiology Policy Research Rotation in Political Affairs, and have developed and conducted their own specialized rotations after program and ABA approval. Rotations take place at UF Health Shands Hospital and the Malcom Randall Memorial Veteran’s Affairs Hospital. Senior residents may have the opportunity to electively rotate at the Winnie Palmer Hospital for Women and Babies or the Arnold Palmer Hospital for Children, both of which are premier teaching hospitals in Orlando.